The Department of Health and Human Services projects that by 2020, the country will face a shortage of 20,400 primary care doctors. While medical experts can only guess at the cause for the declining number of physicians — higher education costs, strict standards for practicing, waning interest — Pennsylvania nurse practitioners like Sheila Gealey think they have a solution. On Wednesday, the Pennsylvania Senate Consumer Protection and Professional Licensure committee will vote on Senate Bill 717, which would grant nurse practitioners full practice authority in the state. Having full practice authority would allow nurse practitioners to open their own practices, bill patients directly and prescribe any medication without needing approval from a physician. Critics are concerned that the bill will hamper collaboration between nurses and physicians and lead to more medical errors, while supporters say this legislation would increase access to health care and decrease related costs. According to a 2015 study by medical professors Michael Richards and Daniel Polsky spanning 10 states, clinics employing nurse practitioners offered better access for Medicaid patients and lower prices for office visits, but this was only true in states with full practice authority. Pitt nursing professor Kathy Magdic said patients appreciate comprehensive treatment, an arena in which nurse practitioners excel. Nurse practitioners are registered nurses who have earned a master’s or doctoral degree and obtained national certification from the American Academy of Nurse Practitioners. Currently, in Pennsylvania, nurse practitioners must work in collaboration with two physicians. SB717 would allow nurse practitioners to function without oversight from a physician after three years and 3,600 hours of training under a collaborating physician. President of the Philadelphia County Medical Society Michael DellaVecchia opposes the bill because — as a doctor — he said it would discourage collaboration and teamwork. 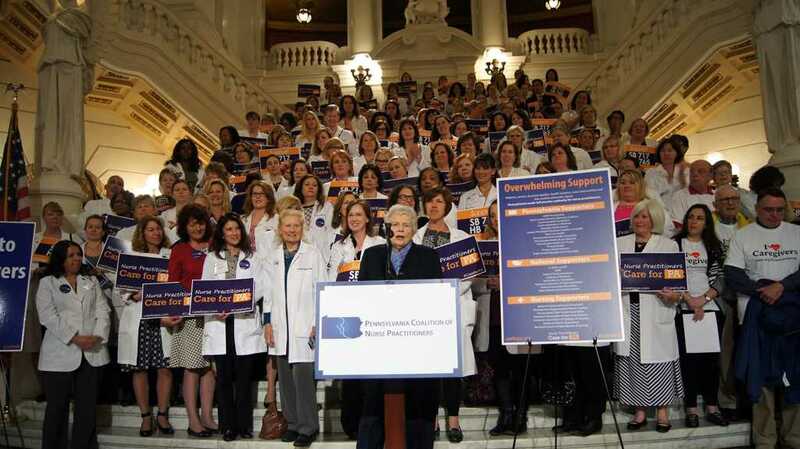 Sheila Gealey, retired nurse practitioner and longtime activist with the Pennsylvania Coalition of Nurse Practitioners, said the bill is not meant to reduce teamwork or take any say away from physicians. “We agree that collaboration is necessary, but we don’t need a written document to provide that collaboration,” Gealey said. For routine office visits, patients could choose to see either a nurse practitioner or a physician, but either way the bill reflects the collaborating physician’s higher rate. Because of this, full practice authority could save money for uninsured patients and those with high deductible plans, according to Susan Van Cleve, legislative chair for the Three Rivers Chapter of the National Association of Pediatric Nurse Practitioners. A 2015 report by Duke University law researchers John Bailey and Kyle Jaep show that increasing autonomy for nurse practitioners would also save the state billions of dollars and increase health care access for patients. Nurse practitioner authority ranges from full — in states such as Washington and Minnesota — to reduced — in states such as Pennsylvania and New York — to restricted — in states such as Texas and California. The most restrictive states require physician oversight for nurse practitioners to diagnose and treat patients, which DellaVecchia said is critical for care. He said that physicians’ training is more intense, involves a higher degree of responsibility and spans a longer duration than that of nurse practitioners. Physicians have roughly 16,000 hours of supervised clinical training, compared to the 3,600 hours required for nurse practitioners under SB717. Van Cleve said a shortage of primary care physicians has forced her to take time away from patients while she searches for a doctor who can write the prescription for her. “Not one study has found that nurse practitioners provide services that are inferior to physicians,” Van Cleve said. The Institute of Medicine published a report in 2011 stating that nurse practitioners have equal patient outcomes and quality ratings as physicians. This isn’t the first time nurses have fought for full authority. Paula Milone-Nuzzo, dean of nursing at Penn State University, said nurse practitioners in Pennsylvania have been working to obtain full practice authority since 1988. SB717 is the closest they have ever gotten. Gealey said despite the opposition, she is optimistic the bill will pass, even if it’s solely for financial reasons. According to Gealey, this law could save Pennsylvania $6 billion over 10 years, largely due to the fact that Medicare generally pays nurse practitioners 85 percent of what physicians typically make. More facilities with full authority nurse practitioners also increases access to health care that can potentially reduce emergency room visits. DellaVecchia said that if malpractice costs, legislative costs, profit in pharmacies and profit in insurance companies did not affect them, doctors could also practice at much less of a cost. Even the notion that nurse practitioners could take only the most routine cases is questionable, DellaVecchia said. “When a patient walks through that door you have no idea what’s basic,” DellaVecchia said. He said that a patient who presents with fatigue could have a virus or the beginning symptoms of leukemia, so treating this patient like they have a routine virus — which a nurse practitioner is more apt to do than a physician — could be damaging. SB717 would grant nurse practitioners the ability to open their own practices and to continue practicing during unexpected lapses in physician collaboration. This would increase access to underserved communities both in rural and urban areas, Gealey said. DellaVecchia said the American Medical Association and the Pennsylvania Medical Society are already addressing the shortage. Solutions including increasing the number of students admitted to medical school and increasing the number of spots in residency programs offer alternative options to the full authority bill. Allowing nurse practitioners to practice independently, he said, would further eliminate incentives for doctors to practice in rural areas because they would be undercut in an already unprofitable market. Van Cleve remains adamant, saying the bill is a necessary change to health care — and Pennsylvania should follow other states in acknowledging its range possibilities.